For some reason the game is not showing the cost in oil to repair my troops. This also happens on the troops screen. I just love the idea of keeping up with changes made. Brings a new dimension to the game. Hmm, that's strange. What were you attacking when you received this? Also, please provide your user ID and the device you're playing on for investigation. Thanks. Attacked a Heavy Vehicle Stronghold, used tokens to continue fighting and when completed tried to repair using Oil. 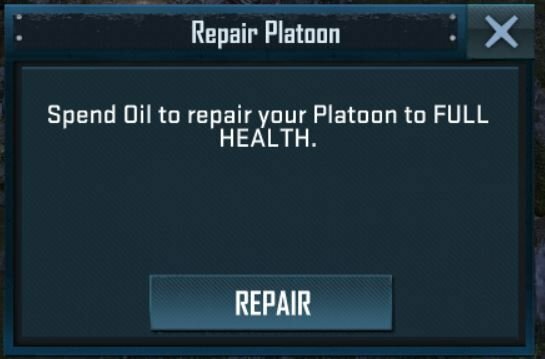 If I return to my own Base and try to repair then It still does not tell me how much Oil it will take. Seen it bunch of times. Kill the session and reopen the app - it will be gone. Comn, there are bunch of other things broken in this game, this should be last one to worry about!